Hey humans! My name is Echo. 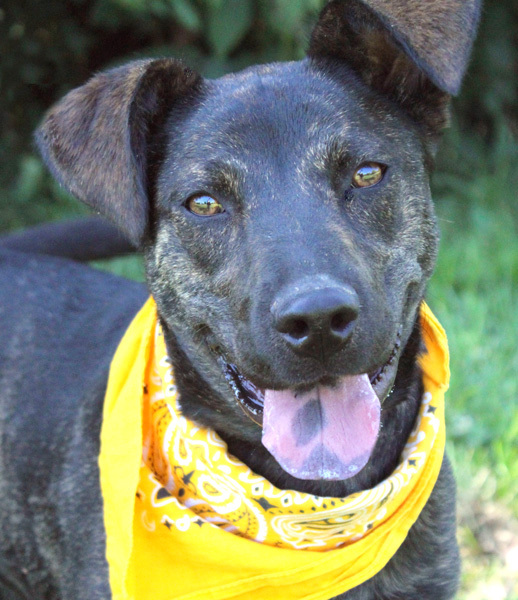 I’m a 10 month old Cattle Dog/Hound… who knows what else mix who came here back in July. See what had happened was this — I was picked up by a Kansas City, KS, Animal Control Officer and brought here ’cause I had a real, real bad injury to my right rear leg/paw. Our humans tried lots of stuff to make me better again, and after a while I got lots better (I had surgery on my paw and somethin’ called a “skin graft” to help me heal). Anyways, I’m all good now, so I wanted to tell ya ’bout me, ’cause maybe my family is out there somewhere and just hasn’t found me yet! (Thanks to all you humans who “share” our blog with other humans ’cause ya never know who might read ’bout one of us and say somethin’ like “I gotta meet that dog or puppy… btw, I dunno what all some of this stuff means, but I think it might help us find forever homes). Ok, so here’s a lil ’bout me, I’ll keep it short. First, I’m a really sweet, affectionate, friendly girl! I love humans and am smart, too! I’ve been to a couple obedience classes and learned stuff like super fast (“sit”, “watch me”, “down” and I’m workin’ on “leave-it”)! I like most other dogs, but I gotta be the BOSS… I’m kinda like a bossy big sister, but that’s not a bad thing, it’s who I am! I’ve made friends with lots of doggies and puppies here, like Bandit, Bianca and Annie. I walk pretty nice on a leash, but can’t go super far yet… even though I’m healed, I still gotta build up to goin’ for real long walks, but I can play for like 2 hours or more a day with my friends! Another good thing ’bout me is I’m pretty much house-trained… I keep a clean kennel! I don’t have any “issues” with food or toys or treats or anything like that, I’m just an awesome girl! If you wanna learn more ’bout me, check me out on Petfinder.com, or HSGKC’s website for info ’bout how to meet me! I gotta go for now… time to go out and run ’round the yard!!! Bye! This entry was posted in bandit, bianca, echo and tagged adopt, adoption, dog, donate, hound, kansas city, pack walk, pet, volunteer, walks by dogsofhsgkc. Bookmark the permalink.